Yesterday I had the opportunity to watch a TED talk given by Elizabeth Gilbert, where she talks about the potential of genius existing outside of ourselves. …and the fear that creative individuals encounter during their creation process, a potential different way to deal with that fear process. 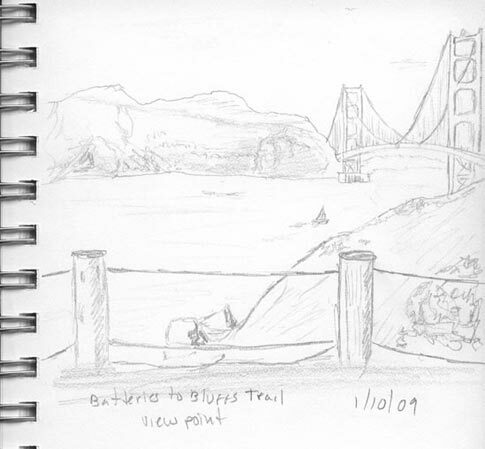 This last SketchCrawl was once again a discovery, I live about one hour away from San Francisco and after all these years of driving thru the Golden Gate and the Waldo tunnel (the tunnel with a rainbow painted on it) I just cant help to continue to marvel at the beautiful views from various locations as well as other structures / buildings. Strangely enough I have not fully explored all the areas of the city as much as I would like, however I hope to be able to spend more time doing so in the future, so that I can concentrate more on the actual event of sketching. This time I thought it would be great If I could drive to the Legion of Honor museum, and perhaps sketch outside and around the area. I also read that if you pay to enter the Legion of Honor museum, you can also enter the de Young museum with the same ticket on the same day. I spent some time a day or two before the event analyzing the area via google maps, to figure out what path to take to get to the museum, so I was technically all set to get there, except I didn’t really get there (oh, I drove by it on the way to the meeting point but didn’t stop – I ran out of time). Back to the story… after I crossed the Golden Gate into San Francisco and was driving on Lincoln Blvd (part of the 49 Mile Scenic Drive) heading towards the Legion of Honor museum. I noticed a small parking area to the right of the road with what appeared to be a path leading to the coast, so I thought hmm since I have never been here… lets stop for a bit and check this area out. 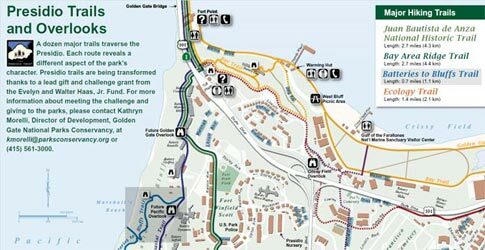 It was an opportunity to view the Golden Gate from the opposite side of Fort Point. The view is nice and there are a couple of trails, one leading down to the ocean. 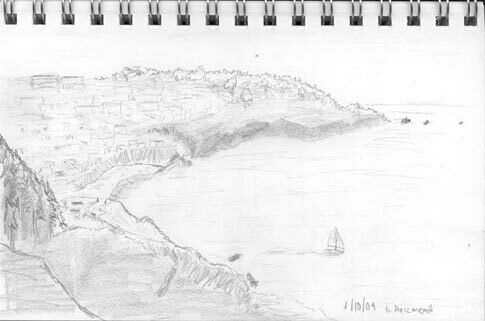 I managed to do only two sketches, I spend a good portion of the day just enjoying the view, going down the trail with a sense of adventure and then working my way up a lot slower, meeting along the way equally challenged individuals resting, for once it was nice to be in the shade… no fog on that day. Below is the view from the top of the trail, facing west towards the Pacific Ocean. On the way down the trail there is a viewing area, where you are able to see most of the Golden Gate. If you know of any other places to discover, please share! Almost a month ago a co-worker from a previous job passed away suddenly. His passing surprised many members of his family, close friends and co-workers from the various companies he had worked at. It surprised me as well. AOL Instant Messenger is what kept many of us in contact with him throughout the years, the technology that kept us in contact with each other even though some of us lived in the same city. The same technology keep us apart from seeing each other in person… sometimes its a lot easier to engage someone via chat that to pick up the phone and call. As we near the end of 2008, I would like to share the following poem with you (which has been in my mind for the last couple of weeks). In life brother, in life. If you wish to give a flower? (Translated from its original language – Spanish). 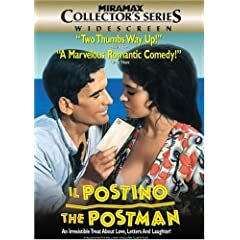 A couple of days ago I finally had the opportunity to watch Il Postino, it had been on my Netflix queue for a while and having recently enabled one movie in my profile, it arrived. All this time I was thinking this movie was more about romance and love… I was pleasantly surprised to discover it was also about the discovery of oneself, our potential and a greater appreciation to that which surrounds us. I came to appreciate the movie even more as I got to watch the movie again while lisening to the audio commentary with Director Michael Radford, and found out that Massimo Troisi who played Mario Ruoppolo died sometime after the shooting of the movie ended. What an amazing story, not just the movie itself but the journey that Massimo Troisi choose to have this picture made. Massimo Troisi came across the Italian version of this story and identified with the postman (Mario Ruoppolo), purchased the rights from writer Antonio Skarmeta, and kept calling Director Michael Radford every couple of months to direct this movie, eventually Director Michael Radford agreed. During the shooting of the movie, Massimo was notified he needed a heart operation and he postponed it so they could continue to work on the film, unfortunately he died right after the movie was completed. What a brave individual, to accomplish his dream until the very last minute. There are many sites that go in detail about describing the movie, I suggest that if you are curious you just rent it or purchase it and enjoy it without a preconceived idea. Here is what in my humble opinion would be the equivalent of trying to explain the movie to you, in the movie the character Mario asks Pablo Neruda if he can explain why “the smell of barber shops makes me sob?” The character Pablo Neruda responds (This is mainly the English subtitle translation and a few words of mine – I am able to understand some Italian words as they are similar sounding to Spanish words). Il Postino was loosely based on a book called “Ardiente Paciencia” written by Chilean Antonio Skarmeta. That little saying/message originated from the movie Neverwas, and every time I look at that note, It reminds me that some things we worry about are just not that important (some certainly are but not all), it also reminds me to keep my childhood dreams alive. Related to the above I recently came across a talk from Carnegie Mellon professor and alumnus Randy Pausch (RIP), which once again puts things into perspective. I hope you enjoy his talk. Sometimes all we need is for us to see someone else demonstrate passion, in order to get us on track with our own discoveries. The first audition I got to see of Britain’s Got Talent 2008 was that of Faryl Smith, a 12 year old girl who sang Ave Maria. I must confess that when I heard how she sang the song I got a little teary eye. The second audition was that of Madonna Decena, a singer from the Philippines. I thought she did an excellent audition as well, like Faryl I wasn’t quite sure what to expect. This song didn’t have the same impact as the first. Faryl’s presentation was amazing. The last audition that I saw was that of Dean Wilson. I know some people love to hate Simon Cowell, but he seems to brings perspective to the situation. In this particular audition I think that the reason why he said he didn’t like the song was because it didn’t appear that Dean was performing with the passion that was needed. I have watched the audition various times and you can definitely tell the second time around there was a lot more passion and conviction.